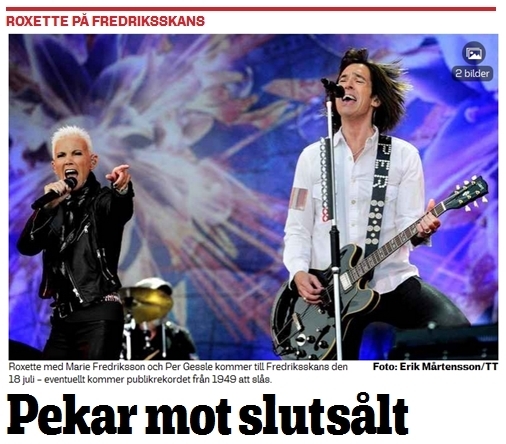 Roxette’s first concert in Sweden this year is on 18th July in Kalmar and according to the organizer’s, Nöjet Konsert’s forecast, the gig might be sold out soon. As Östra Småland informs, the attendance record at Fredriksskans stadium was set on 4th September 1949, when 15243 people were there to see a football match between Kalmar FF and Malmö FF. Gyllene Tider played at the same stadium in 2013 and they almost hit the record with 14946 people in the audience. The organizers expect Roxette to attract around 15000 people, so this way Roxette would hit the number of attendee’s of the GT show. Talking about Kalmar being soon sold out and seeing that there are 3 gigs of other Swedish artists on the list of Borgholm concerts this summer, but the day after Roxette’s Kalmar show is still free at Borgholm Castle, can’t help dreaming about an extra show being added to the already impressive list of European tour stops. In case you haven’t voted yet, you can still do it in THIS article from last December. Just for fun. 😉 Dream on! If you don’t have your ticket for the Kalmar concert yet, HERE you can buy it.